If you’re like a majority of Americans, you wouldn’t think twice about acknowledging your pets as members of your family. If you feel your passion for dogs could lead to a possible career taking care of them you may like to visit K9 Resorts. Since you’re responsible for their well-being, use these tips to help keep your pets safe this summer. During the hot summer months, it’s especially important that you keep a close eye on your dogs to prevent overheating. Dogs are susceptible to heat-related illnesses, which can be dangerous since many dogs don’t know when to rest. While your dog is outside, make sure there is access to water and shade. Frequently check your dog for symptoms of heat stroke such as increased heart rate, excessive panting, vomiting, diarrhea and dizziness. If you suspect your dog is experiencing heat stroke or exhaustion, move your dog inside immediately. Try to lower your dog’s temperature with cool – not cold – water and use a fan to circulate cold air. Even if your dog returns to normal, contact your veterinarian to find out if medical attention is necessary. Hot pavement can also be dangerous for your pet. If the walkway is too hot for your bare feet, it’s too hot for your dog’s feet. To avoid burned and blistered paws, refrain from using concrete paths and instead choose to walk your pet in grassy areas. It’s also important to remember that the car is never a safe place for your pet. Even on a mild summer day, the interior of a parked car with the windows partially rolled down can quickly reach more than 120 degrees. 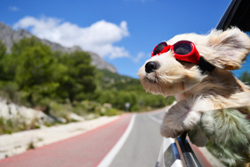 Again, if you’re uncomfortable in the heat, so is your pet – a survey conducted by All Car Leasing looks at the habits of dog owners, and fortunately most people take their pooch into consideration. Just make sure you do to! Fireworks are a great American pastime and a staple at many Fourth of July celebrations. While the bright, dazzling displays elicit “oohs” and “ahhs” from admiring crowds, the experience isn’t quite as magnificent for animals with sensitive hearing. Instead of taking pets to a fireworks show, leave them at home, since they may become startled by the noises and attempt to run away. If the noise from fireworks can be heard at your house, set up a safe area that includes your animals’ bedding, toys, food and water before you leave. You may also want to consider placing them in a room with curtains that block out flashes of light, along with a TV or stereo that can drown out the noise. If your pets must be outside, make sure their identification tags are up-to-date and secured to their collars. Some pets may dig under a fence or chew through crates when they become scared. Once you return home, check on your pets to ensure their behavior is normal. If they display signs of stress or fear hours after the fireworks have stopped, contact your vet. Drinks such as alcohol, coffee, caffeinated beverages and milk. Food such as chocolate, onions, avocados, chives, garlic, raw meat or eggs, grapes and raisins, macadamia nuts and anything containing the sugar substitute xylitol. Household items including toothpaste, cleaning supplies, medication, vitamins and rodent poison. Plants such as lilies, aloe vera, azaleas, baby’s breath, oleander, tomato plants and tulips. Depending on your pet and the toxicity of the item that is consumed, your animal may exhibit different symptoms. These may include, but are not limited to, vomiting, diarrhea, drooling, nausea, expelling blood, lethargy, excessive thirst or urination, and unusual behavior. If you suspect your pet has been poisoned, remove your pet from the area and contact the Pet Poison Helpline at 800-213-6680 to find out about treatment options and whether or not you should seek immediate veterinary attention. By paying close attention to the physical and emotional well-being of your pets, you can help ensure the four-legged members of your family have a safe, enjoyable summer.